In episode 25, Kate Erickson shares why she made the leap from her corporate marketing job to work with her life partner John Lee Dumas on the EntrepreneurOnFire podcast. Kate shares some amazing productivity and systemisation tips to help you find more time in your day (for the important things in life) and scale your business. If you’ve thought about or recently made the leap into entrepreneurship, but you’re finding the journey overwhelming, I want to help you land on two feet and gracefully overcome the challenges that stand in your way. You can do it. You are doing it… as am I. We are in this together! Through the stories my guests and I share on Your Brilliant Un-Career, the Podcast, I aim to help you shift from stuck to inspired, from dreamer to doer. This podcast is proudly brought to you by my bestselling book: Your Brilliant Un-Career: Women, Entrepreneurship, and Making the Leap, out now on Amazon. 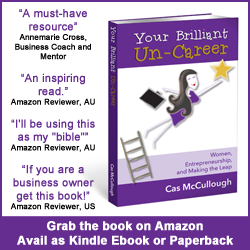 http://bit.ly/uncareerp (Paperback version) http://bit.ly/uncareer (Kindle version), and Writally, because you have better things to do than stare at a blank screen. If you work with the person you are in partnership with, you need to set boundaries. Align your goals and vision for the business. With entrepreneurship, you can create a role for yourself to suit your skills, goals and needs. Keep the benefits of systemising top of mind to motivate you to implement them. Write out everything you are working on each day for an entire week. Take inventory of your business. you’ll start to recognise tasks you do on a repetitive basis. Hiring a coach in the podcast space was a game changer for John Lee Dumas. Connecting with influencers at events can give you a foot in the door. Don’t focus on all the information at once. You won’t be able to process it and take action on it. Focus on one thing at a time to help you move forward. Take a step back. Are you overcomplicating things? There are so many times that you’re going to be way too close to something you’re working on. Give yourself credit for the skills you have built in your corporate job. Kate’s most important tip for someone making the leap: Take some time and start writing out what your skills and expertise are so you can build your confidence and play to your strengths. Chapter 3 of Your Brilliant Un-Career talks about planning and systemising your business. I have done a terrific interview with Alison Vidotto on this topic that I want you to have. Access this interview for free here, along with 32 other business building podcast interviews, templates, worksheets and motivational affirmations. Cas, thank you so much for this chat – I really enjoyed it! I hope the tips and experiences I shared help your community take the next step on their journey! Thanks Kate! Really appreciate you taking the time! Hi Andreas, you can download episodes from iTunes or Stitcher. Cheers, Cas.